Emerson will showcase advanced technological solutions comprising its Exploration & Production (E&P) software suite and services at the Society of Exploration Geophysicists (SEG) 88th Annual Meeting and International Exposition in Anaheim, CA, October 14-19. Presentations delivered daily at Emerson’s booth #2141 will focus on the industry’s digital transformation, with targeted presentations on machine learning, together with geophysics, workflow automation, and cloud delivery. Innovative implementations of machine learning methods with geophysics include the application of deep learning to full-azimuth seismic gathers for automatic subsurface feature classification, marking a step-change in prestack interpretation. A machine learning methodology that uses an ensemble of neural networks for predicting probabilistic rock models from seismic and well data will be presented, for a better understanding of reservoir heterogeneity. Workflow automation demonstrations featuring chronostratigraphic interpretation, geologically-constrained velocity models, and incorporating uncertainties into the static and dynamic reservoir modeling workflow will also be presented. 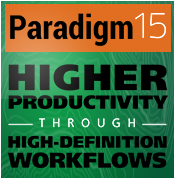 The theater presentations will be supported by Paradigm™ 18, Emerson’s recent synchronized release of exploration and production software. Some of the features of this release will be highlighted in shale analysis case studies. Demonstrations will be presented on the cloud, including a special presentation about high-performance computing. Customer presentations include high-resolution “holographic seismic” processing and imaging, and the application of advanced seismic interpretation methods. Seismic Geomorphology: Mitigating Lithology Prediction Risk and Providing Context for Further Investigation - Applications And Workflows, presented by Henry Posamentier, Monday, October 15. Unconventional Field Development in the Cloud, presented by Hassane Kassouf, Tuesday, October 16. Holographic Processing and Imaging Yields Highest Possible Seismic Resolution, presented by Norm Neidell, Wednesday, October 17. Duane Dopkin, executive vice president of Geosciences, Emerson E&P Software, will be speaking at the Geophysical Return on Investment for Unconventionals, SEG's Business of Applied Geophysics (BAG) Plenary Session, on Wednesday, October 17, 1:50 - 5:50 PM. Florian Basier and Emmanuel Labrunye of Emerson E&P Software will chair the Machine Learning Oral (MLDA 1: Classification for Interpretation 1) and Poster (MLDA P1: Facies Classification and Reservoir Properties 1) sessions on Tuesday, October 16. Click here for more information. Many companies, led by Energistics and including operators and software providers, have invested significant time and money over the past decade to develop and deliver an industry standard for reservoir model data exchange. In 2015 a significant milestone was achieved with the delivery of version 2 of the RESQML standard. From an end-user’s perspective, this was the first version of the standard to deliver capability above and beyond RESCUE, the precursor. Therefore, many active RESQML SIG members are anxious to start benefitting from the efforts. A multi-company implementation pilot of the latest version in commercial use (v2.0.1) is in progress with the intentions to demonstrate the benefits of RESQML and to promote widespread adoption. Energistics and members associated with this pilot will make a multi-vendor live demonstration of RESQML data transfers at the HPC Showcase at 2018 SEG Annual Meeting. Gaby Yelin, Application Geoscientist, will deliver live 10-minute workflow briefs at Demo Station B, in the Emerson booth. Emerson geoscientists will have a significant presence at this year’s SEG technical program, with five technical papers and poster presentations in a variety of sessions. Live software demonstrations will be offered daily, beginning at 9:15 AM. One-on-one demonstrations of the company’s latest technologies and applications are available upon request. Visit the SEG event page to view the detailed agenda, abstracts and get more information on our presence at SEG.